Are you ready our the nail block party? This one piece colorful tips groomer will get the job done in 4 easy steps. Pretty handy dandy, slip one in your bag! Result? Polished and shiny nails. It will come in handy in case of splitting nails. Your nails will look like they came out of the salon! 4 in 1 nail buffer block. Convenient and effective multi-tasking tool. 4 sides, 4 tools, 4 steps: each one has a unique texture for a specific task: file, polish, smooth, shine. Your nails are rough and thick? So annoying when they catch on clothes and ruin your favourite garments. Another good reason to get them back to great shape and allure: polished to perfection and ridge-free! Buff nails have become quite fashionable, but… Don’t go bare like you don’t care. Taking a break from nail polish requires maintenance at the very least. A nice bit of shine will do for healthy finishings. Our 4 way nail buffer will make sure they can live on their own beautifully! How to get shiny nails naturally? Gives your nails a polish treat once or twice a month. Over-buffing can damage your nails, go smoothly Ladies. 1 - White = File. Use it to shape your nails. Square or rounded, it’s up to you. 2 - Yellow = Buff. Don’t overdo it, it could weaken your nails. When it comes to buffing, less is more. 4 - Pink = Shine. A slow rotary movement is the key to get natural shine in seconds. 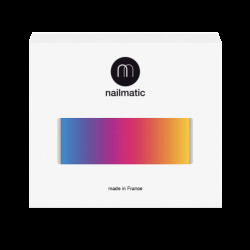 Done: your nails are ready to get a slick of color!! Cleaning instructions: files are washable, wipe them over with a damp cloth and let dry.